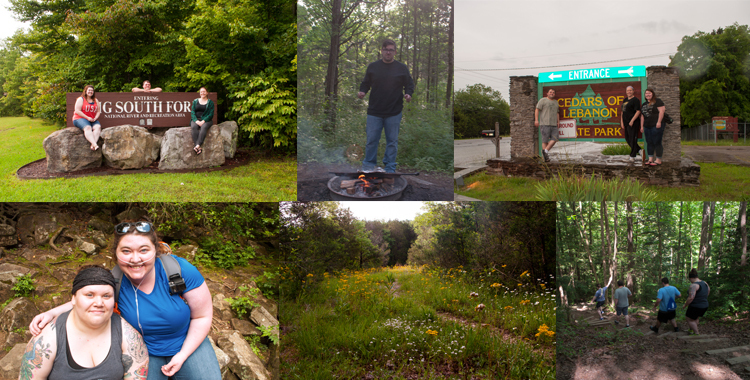 This camping tradition started in 2009, with Lacey, who you’ve met before, and Jesse, a friend beget in the newsroom. He and I used to have all sorts of fun writing news stories that made the administration sweat, and then we’d go tramp through parks and attend concerts in our spare time. I can’t remember which of our trio thought it would be fun to go camping, but we decided to hit up West Virginia for the inaugural trip. Since then, we’ve camped at Red River Gorge, Big South Fork, J. Percy Priest and Cedars of Lebanon State Parks. A spur of the moment camping trip may be just what the doctor ordered to shake your summertime blues – despite Alan Jackson’s proclamation that “there ain’t no cure for the summertime blues.” But when you’re being spontaneous/running from life, take a minute to make some preparations. We usually camp earlier in the summer, before it gets hot as Hades out there. But in 2011, various scheduling conflicts pushed our trip until late July. That was mistake number one – July. It was kind of last minute, and that was problem number two. Problem two led to problem three – we didn’t make a reservation. I had a mental list of places and when we drove by a one that sounded familiar, we pulled in. The place we picked was next to either the Red River or a creek that fed the Red River. I’m still not entirely sure. Not knowing enough about our camp site created another problem: We were sleeping between two creeks known to flash flood. The insufferable humidity of that week precluded some big thunderstorms. When our campsite host pleasantly informed us that our campsite was on a flood plain, none of us slept. Every crash of thunder brought terror. We just kept seeing our tent floating down the river, filling with water as we slept. We decided that we had enough fun for 36 hours, checked out a couple of days early, and went back home. Two years ago, I missed the camping trip. I was being lame and working (the story of my last two summers). Lacey and Jesse camped at J. Percy Priest Lake just outside Nashville. I hear I missed an amazing campsite right on the lake, complete with breathtaking sunsets. I also missed a dead car battery on checkout morning. They called park rangers, who said they would help but then never came back to them. They asked other campers, who did not oblige. Then they started calling friends in the area. Finally, around 6 p.m., a friend of Jesse’s came and jumped the car. They finally got out of the campground and got to finish their explorations, but Lacey had a white-knuckled solo trip home that night. 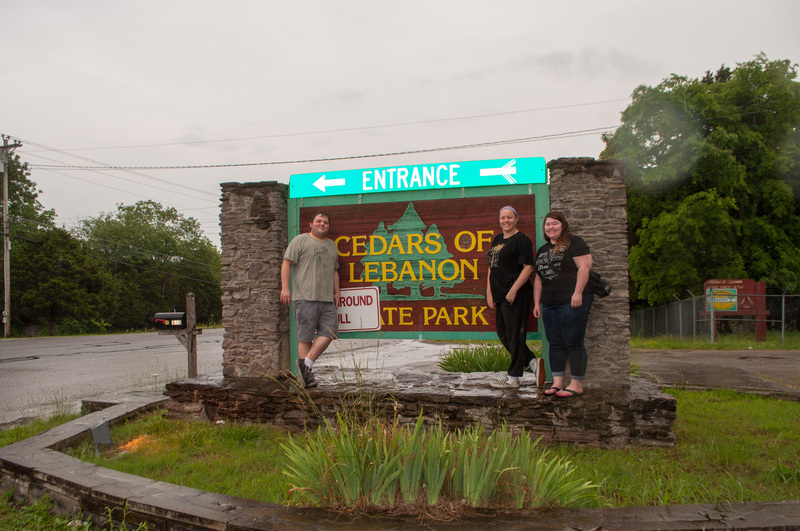 For this year’s camping trip we went back to Tennessee, this time to Cedars of Lebanon State Park. 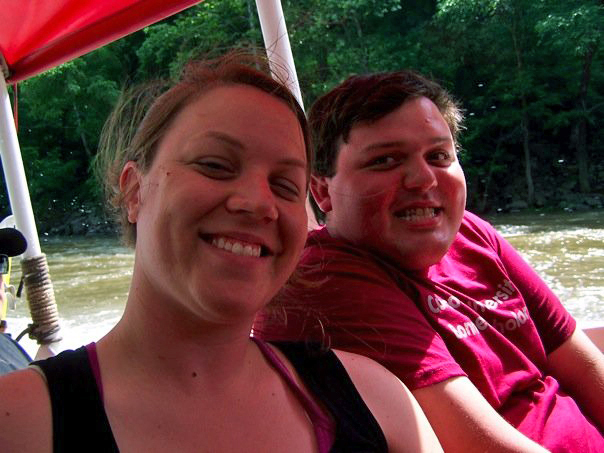 We also brought a couple of friends in on the adventure: Karli and Brandon. They’re also both friends from the newsroom (basically all of my friends came from Student Media) and they’re still newlyweds. Karli and Brandon aren’t really the outdoorsy type. I don’t know if Brandon has ever camped, but Karli hasn’t since Girl Scouts, and that was a less than fulfilling experience. Full disclosure: years ago, I was fanatical about bug spray. I agree, there’s nothing worse than being covered in mosquito bites. But over time, I’ve realized that most bug sprays just don’t work, and I’m too lazy to take the time to put it on. But Karli and Brandon are not as seasoned a camper as I am (I say with a hearty laugh), and they loaded up on the bug spray. We teased them a bit about choking on the cloud of bug spray and sunscreen that followed them around like Pigpen’s dirt cloud, but guess what? Two of the three people who didn’t use it ended up with ticks. So who got the last laugh on that one? Part of being prepared is making sure your gear is in working order. Making sure you have maps and music available offline for those inevitable dead zones is a good idea. So is realizing that waterproofing on a tent doesn’t last forever. I sincerely can’t decide if last year’s trip to Big South Fork was worse than the Natural Bridge Death Hike or not. (See Step 6: Get a trail map.) Where we battled dehydration at Red River Gorge, we nearly drowned at Big South Fork. 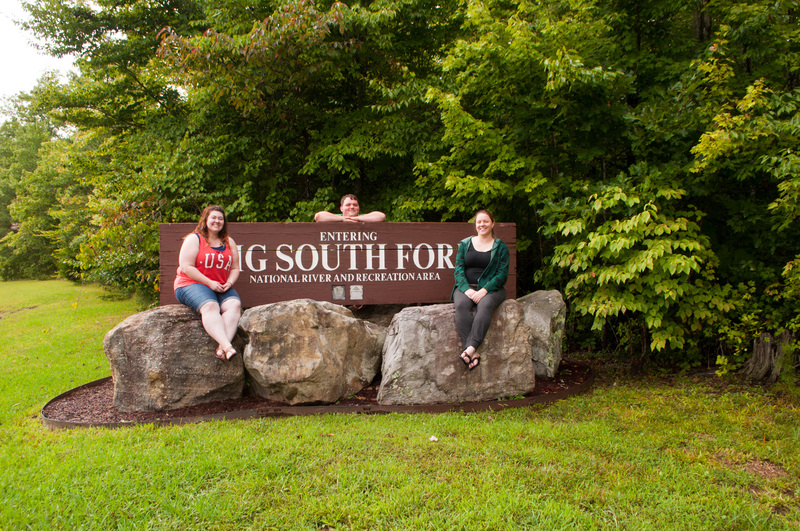 We were headed to Big South Fork in Kentucky, coming from Tennessee. Shouldn’t be too difficult to get to this park, right? It straddles the Kentucky/Tennessee state line. Well, you’ve never driven with me. After the GPS failed us and we drove around in a circle for an hour, we ended up on an unpaved, one-lane road. It looked like the kind of place where they string barbed wire across the road and no one finds your body. To make it worse, when I tried to get back out, a dog charged the car and kept circling us, making it impossible for me to move without hitting him. I finally inched back out to the main road, and we finally managed to find the park – but it was the wrong entrance. So we had to drive 40 miles around the park to get to the correct side and find the campground. We made it just in time to pitch a tent and eat a hot dog before the rain started. We tossed EVERYTHING into my car – firewood, food, chairs, kindling, leaves – and then dove into the tent with a bag of snacks so we could finish eating – despite all the warnings about bears posted all around the park. Now, this tent is the same one that I used in the infamous Gypsy Trip about five years ago. It held up great through a Coloradan thunderstorm – when it was new. Fast forward to last Labor Day and the waterproofing was spent. I had no idea. We laid in the tent playing games and reading, waiting for the storm to pass, all the while I’m assuring my friends that my tent won’t let us down. After all, I’d weathered worse. By morning we were sleeping in a wading pool. But we survived the night in our wading pool, and eventually got the tent emptied out and dry enough to pack. We aborted another camping trip, but decided to check out neighboring Stearns, Ky., before heading back to Jesse’s. We should have taken a look at the weather. Walking in rain this hard is kind of like swimming in the open air. 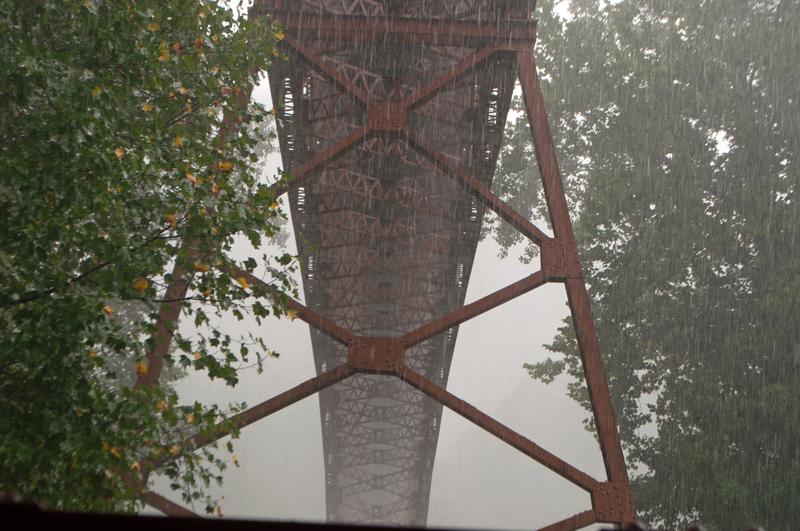 We took the train out of Stearns and reached an interpretive mining exhibit, getting to just about the farthest point from the train station before the heavens again opened up and it started raining so hard all we could see was a wall of water. I’m not kidding folks, animals were lining up two by two. This is the part of the trip we call the “open air swim.” Basically, we ran a mile in rain so hard I had to keep wiping my eyes so I could see. Having oxygen then would have been handy so I could have breathed underwater. Soaked again, we rode the train back to the car. The day wasn’t a complete wash (hahaha pun intended). We did get some amazing pizza from Five Points Pizza in Nashville when we got back that night. Keeping your food fresh and away from animals is campsite setup 101. But that doesn’t always mean that we follow those rules. 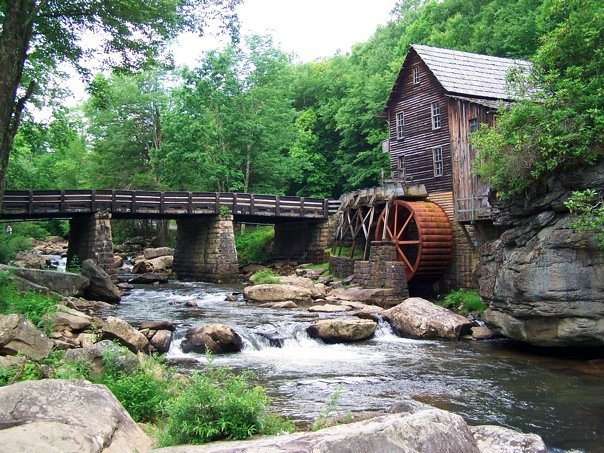 There are so many fun things to do in and around Babcock State Park and New River, including boat rides! The first year we camped, our nice, sheltered campsite at Babcock State Park was at the end of a cul-de-sac. We were well separated from the rest of the guests, so our late night dance parties didn’t bother anyone else around. Our somewhat secluded location, and the fact that everyone else seemed to be in campers instead of tents, made us fair game for the raccoons. We stored our food in a big, plastic box that we locked up at night. But when we were eating, it was open and resting just at the edge of the picnic table. We were lazing by the fire, licking marshmallow goo off our fingers, when we heard scrabbling coming from the general direction of the food, about five feet away. We all turned just in time to see a raccoon do a belly flop from the table into the food box. Jesse jumped up as the raccoon thrust his grimy little paw in the air, grasping a Hershey bar. Ricky the Raccoon looked like he just found the Holy Grail, with his tight little grip on that chocolate bar. In half a second, he was out of the box, and making for the shelter of the dark woods. Jesse was on him with a flashlight and gave chase, but Ricky got away with his loot. Jesse still searched the woods for him for a little while after he was gone, but never was there a trace of Ricky – until the next night when he came back with friends. This time, we were ready, only because we were in bed already, but we’ll pretend like we outsmarted the raccoons. The food was packed safely away and we were snug in our sleeping bags. Fast forward to 2014 – five years after our first camping trip – and we still haven’t learned. When we were camping at Big South Fork in Kentucky, we had a rain mishap that forced us into our tent in the middle of our dinner. We knew the park had bears. I mean, there were only signs every five feet about keeping your food put away. I woke up sometime around 3 a.m. and we were already soaked through. But that’s not what woke me up. The rain had temporarily stopped, and I heard rustling in the trees around us. I laid there, barely awake, my sleep-addled mind interpreting every sound to be a bear coming after the bag of food in the tent. I was having visions of 9-inch claws ripping through the nylon and tearing us to shreds for a bag of Doritos and some string cheese. So I decided to try to get the bag and at move it to my car, at least diverting the bear attack to poor Juan Pablo, my little Sonic. When I’m not entirely awake, I sometimes think I can do things that aren’t possible, like wrangling one of those giant Ikea bags full of food over two full-grown, adult humans – without stepping on one of them – and then get out a zipped up tent door. It was, in fact, impossible. I woke everyone up and then blurted something incoherent about bears and food and tents. I don’t think either one even opened their eyes, they just let me pass. With the food stashed safely in the car, I curled up in my wet bed and went back to sleep. So far we’ve talked about two-thirds of all mandatory camping events: Eating and waterfalling. (Emphasis on the falling.) The third piece is hiking. Usually, hiking is no big deal. But then there are the times we have absolutely no idea where we are or where we’re going. Flash back to the Epic Heat Wave of 2011, and of course hiking seemed like a fantastic idea, so we started on a path at Natural Bridge. Down and down and down we went, not really knowing where we were headed. It wouldn’t have been so bad if we had water with us, and Jesse had eaten breakfast. But it was unplanned, like the rest of that trip, and like the rest of that trip, it was a disaster. We got to the bottom of the hill, got some water and then started back up the hill on a different trail. We had barely covered any ground when Jesse turned completely green. Turns out, hiking on an empty stomach isn’t such a great idea. He recouped, but we all struggled to get back up the switchback trail. I don’t know how long it took, but we were dehydrated by the time we got back to the top. When we found a man selling water, we had to restrain ourselves to keep from rushing the poor guy and taking off with his cooler. Lacey has this way of walking around like she knows what she’s doing, so we just follow her around. I never knew until a few weeks ago exactly why we went down that hill. Apparently, Lacey was looking for a vantage point to take a picture of Natural Bridge from below. The trail we took from the bottom of the hill brought us right beneath Natural Bridge and showed us an easier way to get where we were headed all along. If you ever hike Greeter Falls and you’re looking for the easy trail, its not the one to lower falls. One thing I’ve noticed since becoming a partial invalid is my scale of what is “moderate” definitely does not match the rest of the world. I’ve gotten very attached to the All Trails app for reviews of hiking trails, but even that can’t help you if you don’t pay attention to which trail you’re taking. 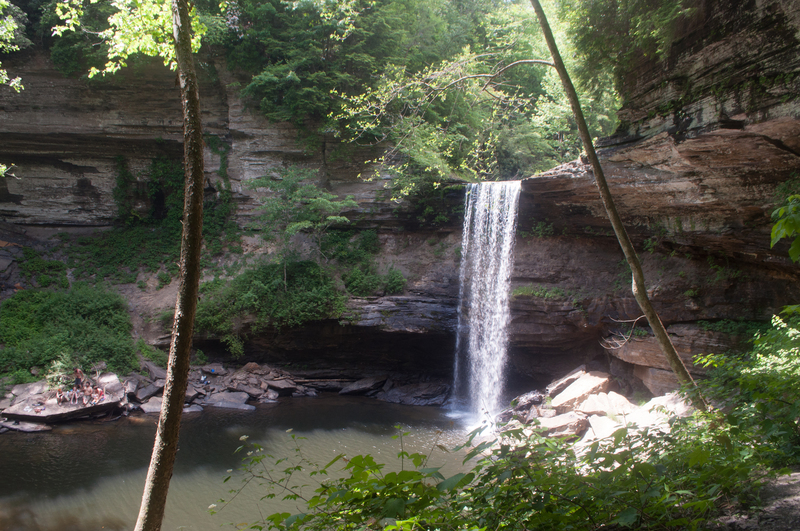 This year’s trip took us to the South Cumberland Plateau in Tennessee. We hiked to Foster Falls first, and it was a bit strenuous, but doable, even for me. The second trail we hit was to Greeter Falls. All Trails called it an easy loop trail about a mile or so long. Cool. Problem is the easy loop trail is the above the falls trail and we took the below the falls trail. That trail was not easy. We climbed through creek beds, hopped from rock to rock and took a spiral staircase down a cliff face. So even if you have a trail map or a trail app, make sure you’re following the right path. Also a good idea is to watch your step. Sandstone Falls are the largest waterfalls in the New River, and they tried to killed me. We are avid waterfall-seekers, and no trip to a waterway would be complete without getting our feet wet. 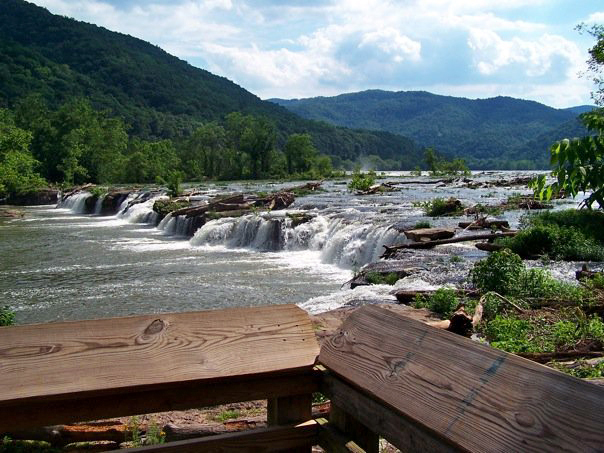 In our first camping trip we visited Sandstone Falls in New River. This is part of a National Park, and there are boardwalks that take you all over in the falls. Obviously, that wasn’t enough for us. We shed our shoes and started picking our way across moss covered rocks at the top of the waterfall. I tend to hang back and see what ways others go, and then pick what looks like the best route (or step where they tell me to). I thought following Jesse was safest, until I stepped where I thought there was a rock — and it was nothing but moss. If you knew Jesse, you’d know why this was a terrible decision. Down I went, lurching toward the edge of the falls. The only things that kept me from going over the 10-foot drop was my leg wedged between rocks and Jesse’s grip on my arm. I had the bruises and scrapes on my shin for a week to remind me of my folly. The morals of our story are thus: Check the weather before you go camping, make sure you are prepared for the weather, and know where you are camping before you get there. It’s also a pretty good idea to keep your food stashed unless you want to get raided by Mother Nature’s little bandits and know about the trail you’re hiking before you start down the path. And remember, if dealing with bugs, sweat, animals, getting lost or rained on doesn’t sound like the time of your life, then maybe camping isn’t for you. It really isn’t for everyone. Even though every year some kind of fiasco happens, we wouldn’t have it any other way. Its all part of the adventure, and makes for a great story to tell. This entry was posted in Adventures, Camping, Hiking, Tennessee, Vagabond Girls, West Virginia and tagged Babcock State Park, camping, Cedars of Lebanon State Park, coal camp, dehydration, Five Points Pizza, Greeter Falls, hiking, J. Percy Priest Lake, Kentucky, New River, rain, Red River Gorge, Sandstone Falls, Stearns, storms, Tennessee, trains, Vagabond Girls, West Virginia by Cassie. Bookmark the permalink.